39 Commercial Real Estate & Properties in Berrimah are listed in 4 categories. We have 29 Industrial Warehouses Sale , 9 Development LandsSale , 7 Medical and Consulting PropertiesSale and 6 OfficesSale . Unit building area 50m2 Masonry block construction Height inside up to 5 metres Roller door height 3.6 metres Electric gate with remote access 24 hour Camera Surveillance Common parking, and amenities Vacant and available View by Appointment 7 Days! For Sale: $105,000.00 + GST For more information, or to arrange an inspection, call Nick Syrimi today at Ray White Commercial (NT) Visit our website rwcnt.com.au to view all our property listings! 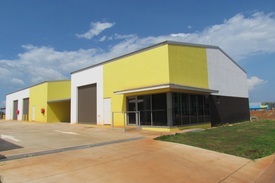 Strata warehouse unit total building area 220 m2 Warehouse area ground level approx. 169 m2 Mezzanine level 51 m2 includes Office 1 area approx. 24 m2 Office 2 approx. 13 m2 Very high ceiling 6.5 metres at the eaves Wide motorised roller door access Kitchenette Disabled W.C Vacant Possession View by Appointment 7 Days! For Sale: $380,000 + GST For more information, or to arrange an inspection, call Nick Syrimi today at Ray White Commercial (NT) Visit our website rwcnt.com.au to view all our property listings! Street front position Total unit building area 292 m2 Ground level partitioned office area 57 m2 Warehouse storage area approx. 120 m2 Mezzanine partitioned offices area 115 m2 Precast concrete construction Eye catching architectural design Very high ceiling in warehouse storage area Motorised roller door 3 metres wide 4x car parks on title 2 under cover, 2 open bays Excellent presentation throughout Suit corporate, professional services or Port related business View by Appointment 7 Days! For Sale: $499,000.00 + GST For more information, or to arrange an inspection, call Nick Syrimi today at Ray White Commercial (NT) Visit our website rwcnt.com.au to view all our property listings! Unit building area 138 m2 Warehouse area 88 m2 Mezzanine office area approx 28.5 m2 Mezzanine storage approx 21 m2 Undercover car parking area (for 2 vehicles) approx. 41.5 m2 Open plan office, air conditioned, carpet floor coverings, phone data etc fitted. Masonry block construction Motorised roller door Front Roller door height 4 mtrs x 3.6 mtrs wide Disabled W.C + shower combined Kitchenette Development Presentation fabulous View by Appointment 7 Days! For Sale: $325,000 + GST For more information, or to arrange an inspection, call Nick Syrimi today at Ray White Commercial (NT) Visit our website rwcnt.com.au to view all our property listings! Unit building area 50 sqm Height inside up to 5 metres Mezzanine storage platform added Electric Roller door height 3.6 metres, width 3 mtrs Masonry Block Construction Electric gate with remote access 24 hour Camera Surveillance Common parking, and amenities View by Appointment 7 Days! For Sale: $110,000 + GST For more information, or to arrange an inspection, call Nick Syrimi today at Ray White Commercial (NT) Visit our website rwcnt.com.au to view all our property listings! Location Berrimah Business Park Street front unit Strata warehouse unit Building area approx. 201 m2 Including office area 17 m2 Shopfront glazing to office Disabled W.C + shower, Kitchenette Roller door motorised 3.5 wide x 4.0 high Building depth 14.80 metres 2 car parks on title, 1 car park is undercover Available now View by Appointment 7 Days! For Sale: $445,000 + GST For more information, or to arrange an inspection, call Nick Syrimi today at Ray White Commercial (NT) Visit our website rwcnt.com.au to view all our property listings! Middle unit in complex Building area approx. 201 m2 Office area 17 m2 Disabled W.C + shower, kitchenette Masonry block construction Roller door motorised 3.5 wide x 4.0 high Building depth 14.80 metres 2 car parks on title, 1 car park is undercover Location Berrimah Business Park View by Appointment 7 Days! For Sale: $445,000 + GST For more information, or to arrange an inspection, call Nick Syrimi today at Ray White Commercial (NT) Visit our website rwcnt.com.au to view all our property listings! This sold concrete block office / warehouse unit is well located in Berrimah. Providing 160m2 of secure warehouse accessed via 3.6 x 4.1m roller door. It has 3 phase power and excellent clearance of 6.7m down to 5m at the rear. It has an air conditioned office of 22m2. There is a fully concrete sealed secure rear yard 3m wide providing 33m of yard area. Total unit building area 128 m2 Mezzanine office 24 m2 Precast concrete construction Eye catching architectural design Very high ceiling Motorised roller door 3 metres wide 1x car park on title Vacant possession on settlement View by Appointment 7 Days! For Sale: $279,000.00 + GST For more information, or to arrange an inspection, call Nick Syrimi today at Ray White Commercial (NT) Visit our website rwcnt.com.au to view all our property listings! Building area approx. 202 m2 Including office area 18 m2 Masonry block construction Shopfront glazing to office Disabled W.C + shower, kitchenette Roller door motorised 3.5 wide x 4.0 high Building depth 14.80 metres 2 car parks on title, 1 car park is undercover New development of 6 warehouse units with ancillary office Location Berrimah Business Park Available for immediate occupancy View by Appointment 7 Days! For Sale: $480,000.00 + GST This property is also for Lease $2,500 + GST per month For more information, or to arrange an inspection, call Nick Syrimi today at Ray White Commercial (NT) Visit our website rwcnt.com.au to view all our property listings! The Vault storage unit Unit building area 50m2 Masonry block construction Height inside up to 5 metres Roller door height 3.6 metres Electric gate with remote access 24 hour camera surveillance Common parking and amenities Currently leased until 31 st December 2019 (to a long term National tenant) View by Appointment 7 Days! For Sale: $90,000.00 + GST For more information, or to arrange an inspection, call Nick Syrimi today at Ray White Commercial (NT) Visit our website rwcnt.com.au to view all our property listings! Strata warehouse unit Masonry block construction Building area 105 m2 Rear yard area 72 m2 security fenced 1 x car parks plus loading bay on title Front and rear roller doors Combined shower and toilet Kitchenette Vacant Possession on settlement Note : The Coolroom with air conditioner is available for purchase: $10,000 + GST or it will be removed prior to settlement. View by Appointment 7 Days! For Sale: $246,000 + GST Also available For Lease at $1,200 + GST per month For more information, or to arrange an inspection, call Nick Syrimi today at Ray White Commercial (NT) Visit our website rwcnt.com.au to view all our property listings! Warehouse building area 189 m2 plus rear verandah area 37 m2 Front office area 27 m2 Side rear yard area 162 m2 with vehicle access Front and rear roller doors Security fenced yard Unit entitlement area 415 m2 Well presented complex with dual driveways and excellent truck access Located within the Strath Village Complex Cnr Berrimah and Strath Rd Short term lease in place View by Appointment 7 Days! For Sale: $475,000 + GST For more information, or to arrange an inspection, call Nick Syrimi today at Ray White Commercial (NT) Visit our website rwcnt.com.au to view all our property listings! 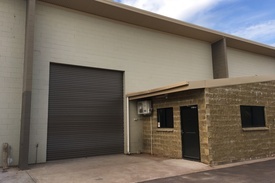 The Vault Storage unit Unit building area 50m2 Height inside up to 5 metres Roller door height 3.6 metres Masonry Block Construction Electric gate with remote access 24 hour Camera Surveillance Common parking, and amenities Currently leased until 31st December 2018 (to a long term tenant) View by Appointment 7 Days! For Sale: $105,000 + GST For more information, or to arrange an inspection, call Nick Syrimi today at Ray White Commercial (NT) Visit our website rwcnt.com.au to view all our property listings! This 80 m² storage shed is located in the modern "Vault" complex on Willes Road, in Berrimah. A high entry roller door provides access to the 50 m² ground floor, with an additional 30 m² convenient mezzanine for storage. The neat and well maintained complex features: secure gated access and security CCTV in a popular industrial location. 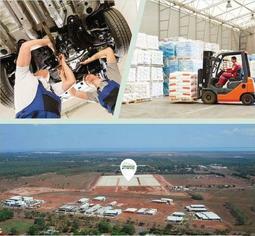 Located in central Berrimah, just 15 minutes from Darwin's CBD, and only 9kms from Darwin International airport. It is conveniently located near Berrimah Business Park, Winnellie Industrial Precinct, Darwin RAAF Base and the Coonawarra Naval Base. Easy access is also available to East Arm, Hidden Valley and Charles Darwin National Park. Brand new warehouses: Warehouse 1, 2, 5 and 6 @ 192m² Warehouse 3 and 4 @ 305m² with mezzanine floor level Includes bathroom, kitchen, offices and loading bay Security fencing and gate. For more information or to organise an inspection, please contact the Agent or Email: darwin@ljhc.com.au. Long Term Tenant. Great Investment Opportunity. Leased until January 2020 with a further 5 year option, this tenant has been happily leasing this property and providing the owner with a secure income currently $23,724.73pa. Priced at only $320,000 it shows a healthy return of 7.4%. Offering ample yard space (fully fenced!!) of 289m2, as well as a warehouse of 172m2 which features dual roller door access allowing exceptional cross ventilation, high clearance, clear span internal space and full kitchen and bathroom facilities with shower. A great affordable investment, you can add to or start your own industrial investment portfolio today. Call Martin 0417 850 933 to arrange an inspection. 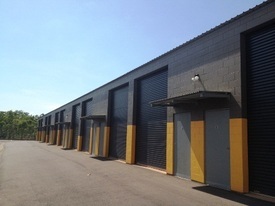 This Office / Warehouse unit is part of a modern complex offering strong solid secure warehousing. Built of Tilt Slab construction it has a high clearance accessed from front roller door plus additional roller door providing great ventilation. Upstairs is a good size open plan office providing plenty of natural light. It provides Warehouse of 184m2, office of 43m2 and rear yard of 53m2. 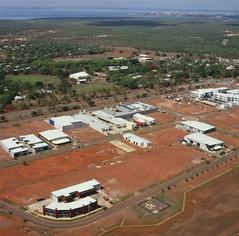 Major multi national Corporations are now able to expand to Darwin assured in the knowledge that Berrimah Business Park in Darwin can provide a quality opportunity in a master planned commercial estate. There are dual entry points into the estate. All roads and roundabouts are to the latest standard, meaning ease of access into the Business Park for both employees and customers. Several significant developments are already well underway with Darwin Corporate Park (22,000sqm of commercial office over 8 buildings), NT Motorcycle Centre, RSEA, HIA, Samios Plumbing and CNW Electrical to name only a few. Commercial lots remain from 2,340m2 to 2.01ha. The commercial zoning (SD31) allows for far more flexibility than an industrial zoning. 27 out of 41 lots already sold with over $40million in sales out of a total $60million for stage one. 25 Miles Road is located in the second row back from the Stuart Highway. The subject site is 2,460 square metres and is priced at $922,500 + GST. Construction Starting Soon - Brand New Corporate Office/warehouse And Warehouse Units From $298,000 + GST / Fro..
Berrimah Business Park is ideally located in the heart of the great Darwin are, midway between the Darwin and Palmerston Central Business Districts. This Location also allows convenient access north to Darwins northern suburbs and south to the East Arm Port. The property is position on the southern side on the central road, Miles Road in Berrimah Business Park and offers a primarily northerly aspect. We anticipate that this location will place this project in high demand from a broad range of small businesses. This exciting new development is highly functional with corporate style office and warehouses. The site is 2,460 square metres with the development including 12 units ranging from 50 square metres to 221 square metres. The design includes a central driveway with units along the eastern and western sides of the block and built to the boundary with units at the rear of the site creating a single U shaped building. The schemes we have been provided with show a modern and stylish appearance and the design has capitalised on the street frontage for the front two units with extensive glass shopfronts. These units will be constructed of rendered masonry block with metal cliplock roof sheeting. This development has deliberately been designed with a corporate profile in mind and we are confident that it will be well received by both local and interstate businesses. There is a combination of eight warehouses from 90 square metres to 108 square metres and three office/warehouses from 158 square metres to 221 square metres; there is also a 50 square metre caf at the front of the development with outdoor seating. Major multi national Corporations are now able to expand to Darwin assured in the knowledge that Berrimah Business Park in Darwin can provide a quality opportunity in a master planned commercial estate. There are dual entry points into the estate. All roads and roundabouts are to the latest standard, meaning ease of access into the Business Park for both employees and customers. Several significant developments are already well underway with Darwin Corporate Park (22,000sqm of commercial office over 8 buildings), NT Motorcycle Centre, RSEA, HIA, Samios Plumbing and CNW Electrical to name only a few. Commercial lots remain from 2,340m2 to 2.01ha. The commercial zoning (SD31) allows for far more flexibility than an industrial zoning. 27 out of 41 lots already sold with over $40million in sales out of a total $60million for stage one. 22 Jessop Crescent is located towards the back row on the right, Jessop Crescent leads directly to Stuart Highway. The subject site is 3,640 square metres and is priced at $1,365,000 + GST. The Closest Land Release Ever in The Northern Suburbs Berrimah is the geographic centre of the greater Darwin, only 9.5 radial kilometers East of Darwins Central Business District, 9.5 radial kilometers North West of Palmerstons Central Business District and 6 kilometers south of Darwins Northern Suburbs. Light industrial parcels of land from 1,263sqm $424k 5,628sqm $1.4m Ideally located just 1.5km south of Karama Suitable for a broad array of businesses Purpose built building options available This is an exciting new land release, the location and design will make these lots highly sought after. The first stage lots should be available in the last quarter of 2017.